Dramatic video showed armed immigration agents storming a National City, California, home with a riot shield marked "police" as they arrested a father of seven wanted on a federal warrant. Brianna Alonso said ICE officers surrounded their home at 43rd and Delta streets with guns in hand Tuesday. They used microphones to order 31-year-old Alberto Alonso Hernández to come outside. Alonso refused to let the federal agents inside of the family’s home until they showed her a warrant. She said the agents stayed in front of the home for three hours when Hernandez refused to come out and at one point disconnected their electricity. Then they began to force their way inside, she said. In the video given exclusively to Telemundo 20, you can hear Alonso on the phone with a legal assistance hotline saying in English that there are five children in the home. The video shows Alonso repeatedly asking the ICE officers to show her the paperwork or the warrant. At one point, one of the agents tells Alonso, "You’ve been watching too much movies." 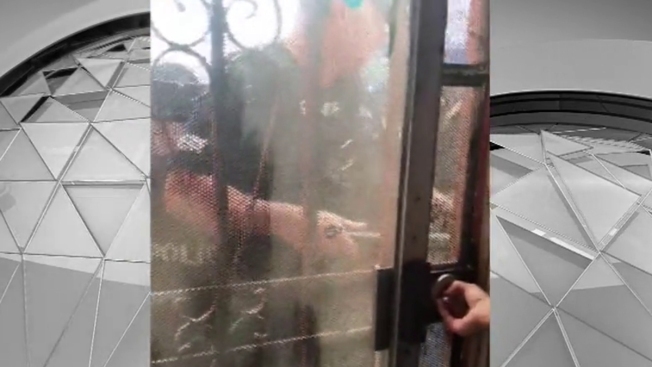 As officers work to open a metal door with a crowbar, he says, "We will show you the order once we finish." Parts of the incident were recorded by Hernandez's 11-year-old daughter who was inside the house, as well as neighbors filming from outside. Officials say the suspect had several deportations and had faced charges of domestic violence. NBC 7 reached out a spokesperson for the Immigration and Customs Enforcement agency. The station was told agents had an arrest warrant from a federal judge, and the man had previous charges for domestic violence and was previously deported. ICE said the agents in Tuesday's raid followed the agency's training protocols. ICE told Telemundo 20 that this was a complicated situation and the intervention of the neighbors complicated the operation. The ACLU of Southern California has published a guide for anyone who is confronted by immigration agents at the door. The guide advises residents not to open the door, and to ask to see a warrant. You can read the guidelines on the ACLU Southern California website or on the ACLU of San Diego and Imperial Counties website.